Charles has been instrumental in the creation of a variety of successful projects, which include educational, athletics, food service, and commercial facilities. He is experienced in designing new and existing facilities that develop unique and exciting spaces to compliment the buildings’ function. His knowledge of building codes and ADA is critical in developing efficient and functional spaces. Charles is involved in all stages of design and production, from master planning through document production, construction administration and project management. He maintains architectural registrations in Kansas, and Nebraska. 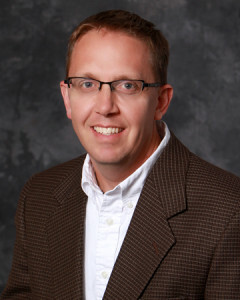 Additionally, he is professionally affiliated with the National Council of Architectural Registration Boards (NCARB) and involved locally with the Salina Community Art and Design Council and the Salina South High Site Council. Charles enjoys seeing and being involved in the clients’ success by creating facilities with exciting spaces that allow our clients to function at their maximum potential. He truly cares about the accomplishment of the client and is passionate about making the process enjoyable by listening to their needs and providing energetic discussion and design solutions. One of Charles’ recent notable projects he worked on was the Salina Community Theatre addition and remodel. The design features new entry, lobby, and common spaces to serve both a new Black box performance space and the original Kephart Theatre creating a state-of-the-art performance facility and beacon for the community. Additionally, he oversaw the construction and design of a major renovation and facelift to an existing convention space that was dilapidated and neglected and has now transformed into a unique addition to the Salina downtown area, now known as Assurance Partners. This enhancement energized Salina downtown and sparked area redevelopment through adaptive reuse of an abandoned structure. Another outstanding development lead by Charles was the USD 305 Hageman Campus Alternative School and Operations Center. This project developed property around the Hageman Education Center adding two new facilities. The Salina West facility serves as a state of the art alternative high school and the Operations Center houses various District departments including, Maintenance, Copy Center, and Media Services. This project has created a unique and efficient campus environment for USD 305 outlying departments. The new facilities enhance efficiency of operations, and include highly efficient lighting and mechanical systems. This contemporary warehouse and office facility includes energy saving features such as high efficiency lights, occupancy sensors to automatically turn off unoccupied areas, and natural light in the warehouse area. The mechanical system features energy transfer and geothermal components that provide long term cost savings. Charles has resided and raised his family in Salina for 22 years. He appreciates the passion that the community has for making Salina a quality place to live and visit. When Charles isn’t busy at the office, you will most likely find him spending time with his family. Coaching his children in their athletic team and staying involved in their interests are important to Charles.